Food Blogging Traffic & Income Report for January 2018. Watch over my shoulder as I show you how to increase traffic and improve your income on your food blog. If you’re new to RecipeThis.com, you may be wondering why I publish my income reports each month. Well the truth is that I have been publishing income reports on my blogs now for 5 years and it helps me stay accountable for what I do. 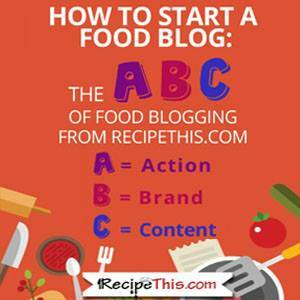 The first food blog I ever owned was back in 2009 when blogging was just taking off. It was fun and exciting, and we loved it. Back then we used to start blogs, build up content on them, drive traffic and then sell them. It’s a bit like being a property developer but of internet real estate and not houses. We did this in all kinds of niches. We had golf blogs, green living blogs, gaming blogs, diet blogs, travel blogs and even a funeral blog. But it was food that had our passion and we always said that if we did want to settle down and concentrate on just one industry then it would be food. It meant that we never really had a long-term attachment to a site and recipethis.com is the first site that we have ever put all our attention into, without other things going on in the background. It has paid off though. All those hours we have put into RecipeThis.com, all the hours that our virtual assistants have put in, the hours our son has put in after school and on weekends and have all added up. Sadly, I know we won’t see this again for a while ☹ this is because this was when our traffic is at its highest for the year. When the hype is on with everyone buying their new kitchen gadgets. It includes our super high boxing day, all the New Year dieters and then it is dying down the further into January that you get. But it still feels fantastic to say that during a 30-day period we got our million. Our target is now to get the 1 million a month from autumn. So, watch this space! Before we move onto all the exciting numbers for January of 2018, I wanted to talk to you about the great depression that we suffer in January. Or generally in quarter 1. You have quarter 4 for example when everyone is spending, and everyone wants a piece of you. The advertising networks have clients that will pay a lot more, then there is the sponsored content. They want to get out there in the run up to Black Friday and to Christmas sales. Then all of a sudden, the New Year hits and they don’t want to know. I think of it like the travel season. In the travel industry during the school holidays you can be paid a lot more for hotel rentals, flights and even car hire. But in the quiet time of the year, you are having to charge a small fee, just to get numbers on seats. Overall, over the year you will do very well financially and that is how you must look at it. Don’t get depressed and instead, think of your income over 12 months and not just for one month of the year. I would also suggest using this quiet time of the year to your advantage. Use it to get your head down and work on your content, work on your new book that you have planned, work on improving your SEO or even go on holiday when the prices are cheaper! This leads to a total food blogging income from Recipe This For January 2018 of $9270.07. What is strange for us, when we do these income reports is the amount of time we spend on a currency converter. You see we have income in Euros, American Dollars, Canadian Dollars, Australian Dollars and British Pound. Our bank accounts are in Euros, but we do the income reports in US dollars just because we have been paid online for so many years in Dollars that it makes life easier. So sometimes our income might even seem higher or lower than what it should be, due to the currency rates. For example, right now we feel like our income has gone down. This is because we are not getting as many Euros for the Dollar right now. But when paying for things in Dollars it is currently cheaper. While many of you are depressed because January is low for many food bloggers due to the low advertising network rates, we actually love January. Yes, our advertising network income is lower, which is a hard pill to swallow. BUT sponsored content is still good for us and BEST OF ALL people are spending money on ebooks and accessories for the kitchen gadgets that they got for Christmas. Plus add to this that we have about 70% healthy recipes and think of all those people on a diet. Plus, January as a rule is always our highest traffic month of the year. I keep being asked what is the deal with Monumetric? Especially considering it is our highest income stream. So, I thought I better give you the scoop. It is an advertising network just like MediaVine and AdThrive. To be able to join you need to have at least 80,000 page views a month. In fact, we signed up with them when we had over 300,000. They are often thought of as the middle ground. With MediaVine you only need a small amount of traffic to sign up, compared to AdThrive where you need over 100,000-page views. Monumetric only allows you to be approved, IF all of their advertisers approve you. Therefore, it is this nervous waiting game when you sign up. The reason we left MediaVine was because they added more ads to our site than we gave them permission for, but with Monumetric they show less ads for more money. So, a WIN WIN for us! To say that we have earned $1000 a week with them for our time so far and considering we don’t get a HUGE amount of traffic, I am rather pleased with how things are going. They only serve the ads in English speaking countries which accounts for about 97% of our traffic, then the rest of the time it is Adsense. We are also still running Adsense and Amazon ads in just 2 positions, so its nice to have a good spread of ads without it ruining the visitor experience. Because we went viral in December, we never expected to have a traffic month much higher for January. Our target was to hit 800,000-page views and be slightly over Decembers traffic. In the end we got just over an extra 50,000+ page views so we are really, really pleased! As usual there is not much of a change with our top 10 traffic sources. Google search, Pinterest, Facebook, direct traffic and of course when we have been featured in round ups. I always get on as many round ups as I can, but I also find that from having good positions in Google, that people naturally find me to feature me in a round up. I always LOVE looking at my SEO positions. The first thing I do when I go on my laptop to work, is to check how my Google positions are doing. Its my highest traffic source and I need to keep an eye on it and make sure it is performing. We are planning some time off this summer for family time. It will probably be the last summer before our eldest son (he will be 17 in August) wants to go on holiday with his friends instead. A chance for us all to have some bucket list worthy fun and because of this we need to get ahead on our content. So, we are now on mission blogging. Lots of photos, lots of recipe testing and a gradual scheduling so that we have less content to worry about. Then when we are away we will just have social media and emails to take care of.